The BatteryMINDer® automatically dissolves harmful power-robbing sulphation using safe, patented high-frequency pulse technology**. Guaranteed to increase your battery’s life and performance, or you get 100% of your money back within 1-year. 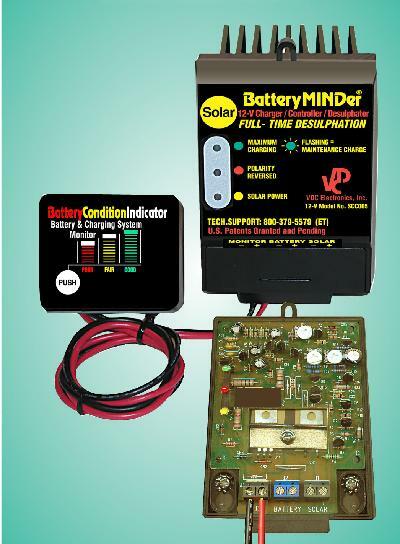 The BatteryMINDer® is a 3-mode charger/maintainer/conditioner that extends performance and life of all types and sizes of 12 Volt lead acid batteries. These include maintenance-free, marine, deep cycle, sealed, gel, and all popular brands of AGM dry-type, valve-regulated batteries, such as InterState, Exide, Optima and Odyssey. ** Sulphation is the #1 cause of early battery failure and loss of performance as determined by the Battery Council International, Dec. 1998. Allows you to charge and maintain multiple batteries at a time. Quantity of batteries depends on the size of solar panel(s).